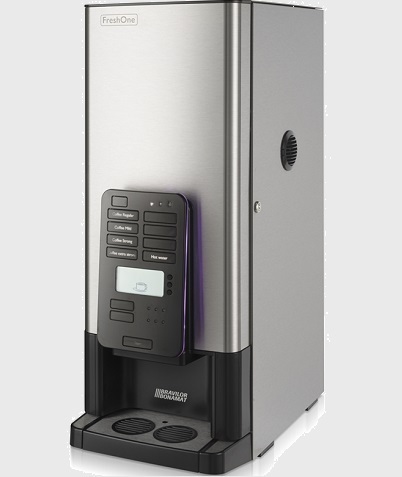 Provided with one large canister for fresh brew coffee (fresh filter coffee) and a separate outlet for hot water to make tea or soup. For locations with water connection. Additionally, the machine has been equipped with digital control, plastic drip-tray, automatic descale indicator and rinsing programme. Five standard LED colours and the option to set one colour as desired. Little maintenance: automatic descale and rinsing programme. Unique hot water system: less sensitive to scale. Selector button for cup, mug or (vacuum) jug coffee from fresh filter coffee.